Building on their momentum from previous driving games, comes Wild Riders. The player takes the role of a one of two riders, Keith Raven or Trish Moon who are both on the run from the law. The game involves a high-speed pursuit through a cityscape with players needing to avoid capture by the police. 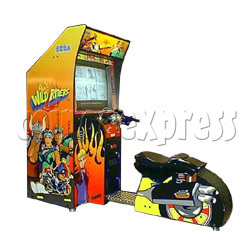 The player pushes down or pulls up on the innovative motorbike handlebars, which enables the player to make the jumps over bridges and slide under barriers and articulated trucks. The right hand grip has a rotating throttle with a hand brake to stop the front tire. The rear tire is stopped using the brake pedal mounted in front of the right foot peg. The player must time slides and jumps to perfection to increase the gap over the police. Of course if the players timing is off, the player runs the risk of crashing or worse being caught. Hitting small objects adds additional time and bonus while hitting large ones takes time away. The system comes in a sit-down cabinet which is equipped with a high-resolution 29" monitor. Sega's Naomi 2 GD ROM hardware system, this allows Wild Rider to surpass the speed and graphics of Crazy Taxi. For added realism the machine comes with a sub woofer in the seat so the player can feel the action.